Added on 06 July 2017 . By Faith Strickland. London is full of institutions, spaces that have been around longer than any living memory, with just as many stories to tell. Balls Brothers is one such group, a series of bars that have fed the city’s insatiable thirst since 1860, and despite a wobble in 2010, the chain is still going strong. With eight outlets focused around the City, Balls Brothers has become a go-to when it comes to fail-safe dishes and good cocktails; we headed to the Austin Friars venue to see if they’ve still got the goods. Despite the jutting skyscrapers and ‘80s modernism, the City of London is old at its core. 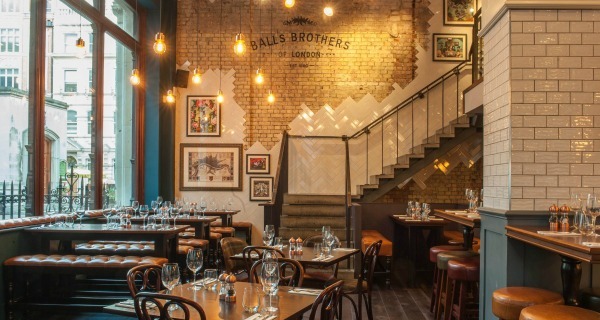 Balls Brothers Austin Friars reflects this; hidden down twisty, turny passages moments away from Liverpool Street, the venue is stripped back and low-key in a typical East London fashion. Walls alternate between rich royal blue and carefully exposed brick, lights are low hanging and bare bulbs, and the chefs cook in an open kitchen at the back of the venue. The restaurant and bar mesh into one, with double height ceilings, and a second mezzo floor offering more relaxed dining. On a payday Friday, this City spot was filled to the brim with people ready to blow a good proportion of their wages. Groups of colleagues crowded round the tall, polished wooden tables, top buttons undone and cocktails in hand. It was expectedly noisy, however by 8.30pm, things had calmed down considerably, with party-goers leaving to make way for the casual drinkers. Minutes from Liverpool Street, Balls Brothers Austin Friars is perfect for after-work drinks or lunchtime pit stop. Balls Brothers has been working in wine longer than you’ve been been knocking back the stuff. Founded in 1860, the group was originally a wine traders and bar. In the last 150 years or so, however, they’ve stretched their wings to encompass all sorts of drinks. The menu was laid out in an easy and accessible way with gin, whisky and fortified wine assorted according to a flavour map. As well as a huge range of renowned spirits (Gin Mare and Aviation were both on the list), the venue also has a surprisingly good cocktail list. Separated between classics and gin-based, the cocktail menu tends to focus on the short and sharp; the Corpse Reviver (£9) was a potent mix of gin, absinthe, triple sec, lillet blanc and lemon juice. Rosemary Royal (£9) was just as punchy, though made a lot sweeter with a muddle of Gin Mare gin, G H Mumm Champagne, rosemary syrup, lemon juice and sugar. 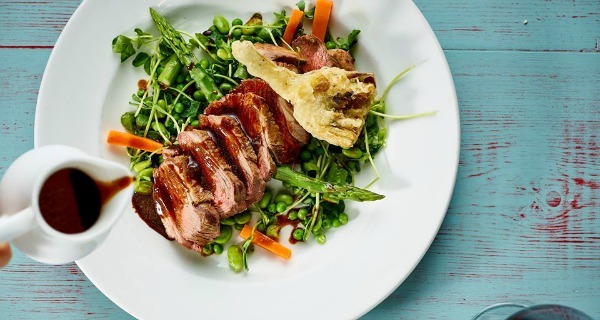 Ball Brothers Austin Friars is clearly a City lunch time spot, but before you write it off, the food is a fail-safe, moreish mix of homely classics and summer salads, that were perfect for a relaxed catch up. Ranging from hand carved ham, egg and chips (£11) through to fish and chips (£13.50), dishes were a cuddly option of pub classics, made to the highest standard. The smoked haddock risotto (£16.50) was thick and creamy, topped with a poached egg and given depth by a salty parmesan cheese. The food is fresh and seasonal at Balls Brothers Austin Friars. Balls Brothers may be a London institution but it certainly doesn’t take advantage of its position. Cocktails are crafted with some of the best spirits and wines in the business, and a steal at £9, while their food menu proves that quality over quantity works every time.